Museum Kampa, Prague – Beneath the Charles Bridge, the city’s hidden highlight is housed in a converted watermill on the bank of the Vltava. Descending a staircase from the bridge, along a picturesque cobbled street, before reaching the museum, the visitor will find three giant bronze babies. A surreal sight, each stands about three metres tall with a ventilation shaft for a face. Originally the babies appeared on the Zizkov television tower. 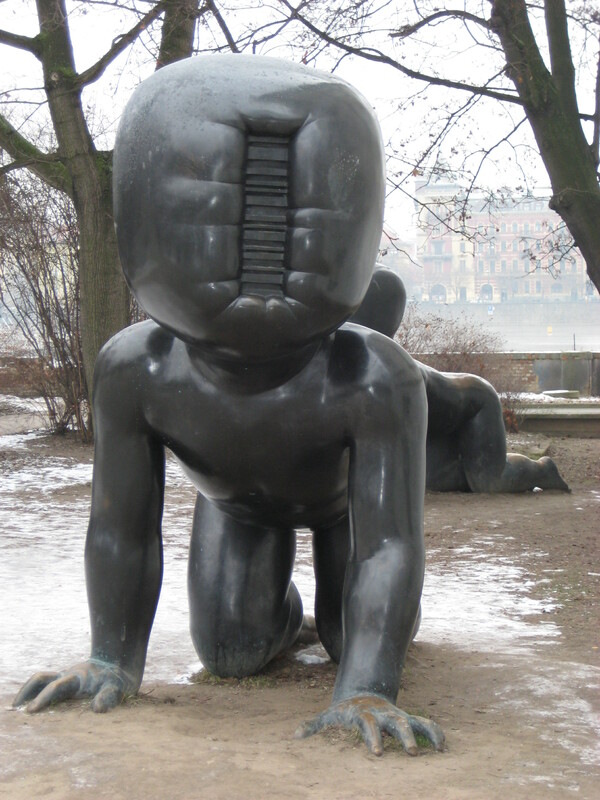 They proved so popular with locals that sculptor David Černý created this permanent installation. Housing the private art collection of Jan and Meda Mládek, the museum also has on show contemporary Czech work as well as playing host to temporary exhibitions. Included in the collection is a series of works by the Czech artist František Kupka (1871-1957). Kupka’s abstract works, some of the first in Western art, were disapproved of by the communist authorities. Since 1989 Kupka’s work has received greater prominence. The collection includes a number of notable oil paintings including The Cathedral (c. 1912) and Cosmic Spring – Creation (c. 1919-1920). The collection also contains a number of pieces by the sculptor Otto Gutfreund (1889-1927) including a series cubist portraits. On the second floor is a collection of contemporary painting and sculpture. Stjepan Gračan’s Untitled (c. 1980s) work is particularly striking. Until February 6, 2011 ran the temporary exhibition, a retrospective look at the careers of Josef Svoboda and Robert Wilson, Light up the Lights. According to one of the curators Daniel Dvořák, the exhibition offers an interesting comparison of two specific creative concepts. “While Josef Svoboda created – above all – stories and dramas using light, Robert Wilson uses light to paint bewitching stage scenes.” The exhibition included drawings and sketches from both designers as well as large projections and elements from individual stage designs. Of superlative quality included was a lighting set from Wilson’s staging of Philip Glass’ Einstein on the Beach and video of Svaboda’s staging of La Traviata. © To Your Arms, 2010, 2011. Unauthorised use and/or duplication of this material without express and written permission from this blog’s author and/or owner is strictly prohibited. Excerpts and links may be used, provided that full and clear credit is given to To Your Arms with appropriate and specific direction to the original content.